Well, I had the book I was going to write about all picked out but then I read A Murder of Magpies and knew that I had to change my book. 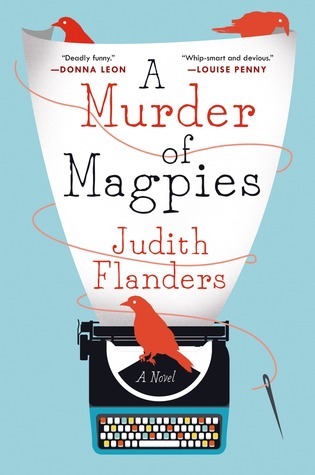 A Murder of Magpies by Judith Flanders is a page-turning, fun and funny mystery set in the publishing world of present-day London. The heroine of the story is Samantha “Sam” Clair, a single, “middle-aged, middling-ly successful” book editor at the publishing house of Timmins & Ross. The story begins when Sam arrives for work and several strange things happen during her day. The first strange event is when police Inspector Jake Field shows up to speak with her to see if she was expecting a delivery of a package. A bike courier was killed in a hit-and-run accident and his deliveries were missing. Sam’s name was on the courier’s delivery list. Unfortunately Sam has no idea what the missing package could have contained. After a busy day at work, which included playing phone tag with Kit Lovell, one of her authors, the second strange event happens when she arrives home to find out from her neighbors that some workmen tried to access her apartment—workmen Sam didn’t order. Sam finally gets in contact with Kit Lovell that night. Kit is a gossipy fashion writer whose newest book is an exposé on the death of Spanish fashion designer Rodrigo Alemán and his relationship with the fashion house Vernet. Sam finds out that Kit’s typist might have sent a copy of his manuscript to Sam via the courier who was killed that morning. Kit also discloses that his apartment had been broken into and searched. Kit feels that he is being targeted by someone who wants to stop publication of his book. The next day, Sam becomes worried when Kit doesn’t show up for a lunch meeting and she grows increasingly frustrated and worried by not being able to get hold of him through the rest of the afternoon. When she still can’t get in touch with him the next day, Sam calls Inspector Field and fills him in on the book, the break-in, and her missing author. When Inspector Field doesn’t seem very interested in finding her author, Sam decides to do some looking on her own. It’s all in a day’s work as Sam discovers money laundering schemes, gets pushed down the stairs by someone who broke into her apartment, goes to Paris for a fashion show, and deals with her most successful author’s new book, which seems to need some work in order for it to be another bestseller. Sam gets help in her search for Kit from her glamorous mother, a London tax attorney, Sam’s Goth assistant, Miranda, and even Sam’s reclusive upstairs neighbor, Mr. Rudiger. Also as the investigation goes on, Sam and the Inspector discover that there is definitely romantic chemistry between them. The investigation, though, takes a serious and urgent turn when an unidentified body is pulled from the Thames and until the DNA analysis comes in, the assumption is that the body might be Kit’s. Sam is comfortable with herself, her job and her life. She’s protective of her friends and while she might be new to the detection business, she’s determined and smart. Fortunately she seems to keep her sense of humor throughout the story and I enjoyed her wise-cracks which she keeps to herself–mostly. I don’t know if there will be more Sam Clair mysteries, but I hope so! Apparently the hand-tied bits of thread, feathers, and hooks that fly-fishermen use can have really colorful names, such Platte River Special, Vegas Showgirl, and Dead Man’s Fancy. 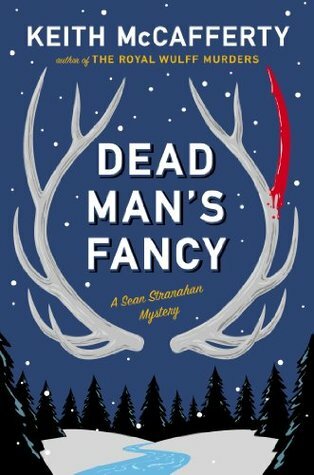 You don’t have to be a fisherman, though, to enjoy the mystery Dead Man’s Fancy by Keith McCafferty. I found it to be an engaging, suspenseful story with colorful characters and a spectacular setting. Set in the great outdoors of Madison Valley, Montana, the location is an integral part of this mystery series featuring Sean Stranahan. A former private detective from the East Coast, Sean now lives in Montana working as a fly-fishing guide and artist. Local Sheriff Martha Ettinger finds Sean’s skills very useful and occasionally employs him to assist the small sheriff’s department. The book begins with a search for a missing woman who was called “the Fly-Fishing Venus.” Red-haired Nanika Martinelli worked as fly-fishing guide who seemed to attract fish and customers wherever she worked. Nanika fails to return from a trail ride, sending Sheriff Ettinger and her team on a search in the mountains for her. Ettinger doesn’t find Nanika but she does find a fellow ranch worker who had been searching for Nanika impaled on a dead bull elk’s antler. The dead elk had been claimed by a wolf pack so was the worker’s death caused by a human or by an animal? Where is Nanika and was she attacked by a wolf? The politics of the wolf’s role in the West and the reintroduction of wolves to Yellowstone National Park is the central theme of this mystery as Ettinger and Sean find themselves in the middle of the wolf-lovers and the wolf-haters. In her youth, Nanika had been part of an animal-rights group called the Clan of the Three-clawed Wolf and had been involved with the group’s charismatic leader, Fen Amorak. With the continued disappearance of Nanika, Sean is hired by Asena, Nanika’s Canadian sister to find her and to find out if Amorak was involved in Nanika’s disappearance. As with many investigations, Sean and Ettinger have to start in the past to find out what happened in the present. Details of Nanika’s life with her trapper father start to come out as well as her eco-terrorist activities with the Clan of the Three-clawed Wolf. Sean also starts to question Asena’s motivation—is she really interested in finding her sister or is she more interested in seeking revenge against Amorak? Sean gradually sifts through the clues figuring out which ones are pertinent and which are not. He uncovers the facts of Nanika’s life, finds Amorak, and of course, gets to do some fishing along the way. The case comes to a dramatic conclusion on the shore of a lake located high in the mountains of Yellowstone. Not being a “Ripperologist” (someone obsessed with all things related to Jack the Ripper), I have to admit that I almost didn’t check out this book due to the words “Jack the Ripper” included in the description. Mysteries, though, that have interesting protagonists with an intriguing continuing story-line, are the types of mysteries that I enjoy reading the most. Detective Constable Lacey Flint of Now You See Me fits very ably into this category. She is a character that I don’t think you will soon forget. Now You See Me begins with Lacey covered in blood—fortunately it’s someone else’s blood. When she returns to her car after interviewing a witness, she finds a woman leaning against her car. When Lacey approaches the stranger, she finds the woman’s throat has been slashed only minutes before. Lacey rushes to the woman to try to help her and watches as the woman dies on the street. Even though Lacey is a witness to the crime and a junior officer, she finds herself re-assigned to the murder investigation. Then the case takes an ominous turn when an anonymous letter is sent to a reporter. The letter mentions Lacey by name and also makes references to London’s most famous serial killer, Jack the Ripper. Does the Metropolitan Police have a modern Jack the Ripper on the loose? Will this murder be the first in a series of Ripper-like crimes? As the investigating officers grapple with the seemingly random killings, they struggle to uncover anything that might link the victims as well as try to figure out where in modern London the new Ripper will strike next. Lacey also finds herself under scrutiny by fellow officer Mark Joesbury. Detective Inspector Joesbury is suspicious of Lacey’s involvement with the murders and wonders why the killer is fixated on Lacey. Lacey finds that her tightly-controlled and carefully ordered world is starting to unravel as the killer taunts her with secrets from Lacey’s past. 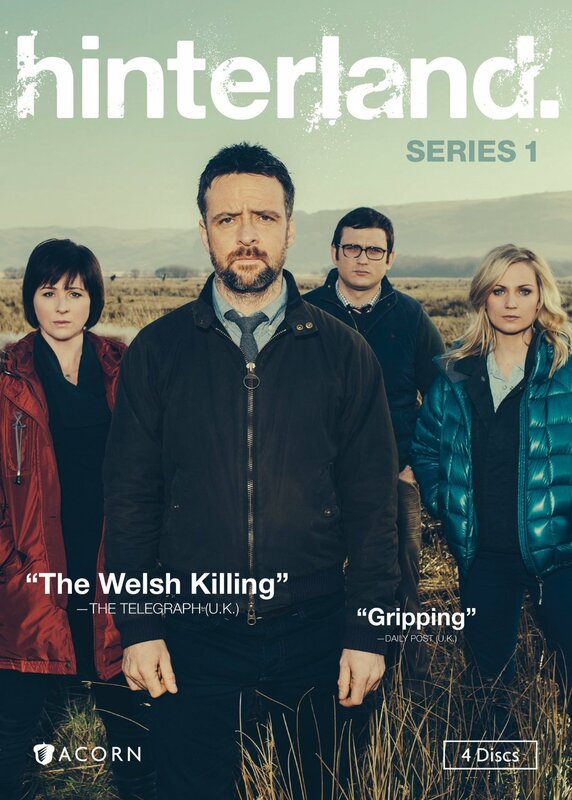 As Lacey and the rest of the investigating team try to solve the increasingly horrific murders, the plot takes a few twists and there are a couple of surprises which I don’t want to give away. Now You See Me is a faced-paced read that I couldn’t put down. For me, the Jack the Ripper plot-line isn’t as compelling as Lacey’s own story. The mystery does contain a lot of information on Jack the Ripper’s murders as well as the various theories of who committed the murders in 1888. A warning, though, the book has graphic descriptions of both the historical and modern murder scenes. While S.J. Bolton has written two more books featuring Lacey Flint, Dead Scared and Lost, I would start with Now You See Me so you’ll have a better understanding of Lacey Flint’s story. Check the WRL catalog for Now You See Me. Virginia can proudly claim a number of records in United States history — having the first permanent English settlement, the birthplace of eight U.S. Presidents, and the oldest Executive Mansion still occupied by a state governor. 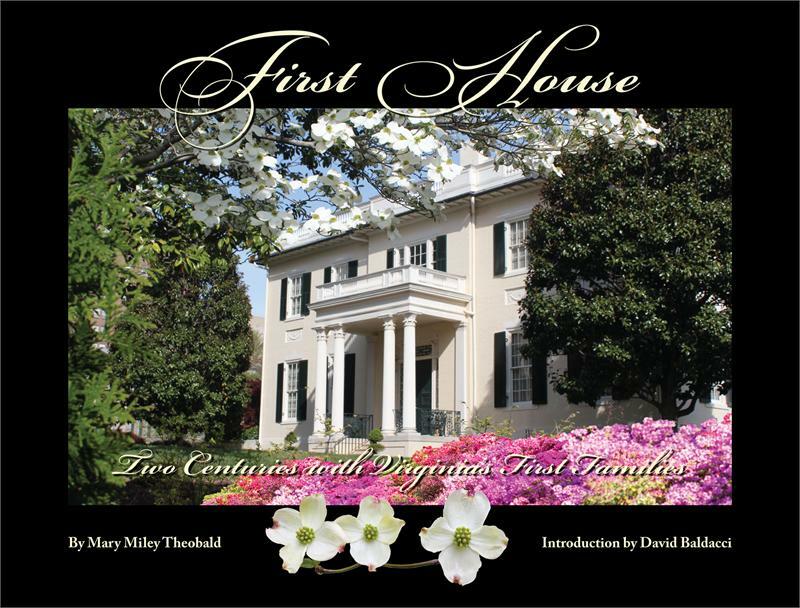 This year marks the bicentennial of Virginia’s Executive Mansion and the beautiful book First House, Two Centuries with Virginia’s First Families tells the interesting history of the mansion. Written by Mary Miley Theobald, the book is published by the Citizen’s Advisory Council for Interpreting and Furnishing the Executive Mansion and the Library of Virginia. It shows how the mansion combines being a historic site and a place for business and receptions, with being a home for the governors and their families. The story of Virginia’s Executive Mansion actually begins in Williamsburg. During the Revolutionary War, both Patrick Henry and Thomas Jefferson lived in the former Royal Governor’s Palace. When the British landed in Portsmouth, the legislators decided that Richmond would be a safer location for the Capitol of Virginia. So in May 1780, Jefferson packed up what was left of the Palace’s furnishings and moved to Richmond. For 32 years Virginia’s governors made due with a neglected house purchased by the state near the new Capitol Building. Finally in 1811 the monies were acquired to build a new house for the governor. The house was completed two years later. Governor James Barbour of Orange County, his wife Lucy, and their three children were the first family to live in the Executive Mansion. Author Mary Theobald chronicles the house’s story as each governor moves in and adapts and decorates the house to their own needs. The well-used house has endured two fires — the first one during the burning of Richmond in the Civil War and the second one in 1922 when the retiring governor’s 5-year-old son’s sparkler set a Christmas Tree on fire — and several renovations and an addition. The last major renovation of the house was under Governor James Gilmore III (1998-2002). The renovation returned the historic portion of the house to its 1830s appearance while improving mechanical and technology systems and strengthening the structure. In addition to the chronological narrative, Theobald has chapters on the gardens, distinguished visitors, the First Families and their pets, Christmas, and the staff who work behind the scenes to make the mansion run smoothly. The book is beautifully designed and has wonderful photos, prints, and engravings. There are also little sidebars of trivia and information that are fun to read, like the story of the painting given to the mansion by Nancy Langhorne Astor, the first female member of the House of Commons, as well as the stories of the mansion’s ghosts. One of Virginia’s recent First Ladies called the Executive Mansion “a happy house” and that happiness certainly comes across in this book. It doesn’t matter whether you are a Democrat, a Republican or an Independent, any Virginian will find this book fascinating because the story of the Executive Mansion is also the story of Virginia. 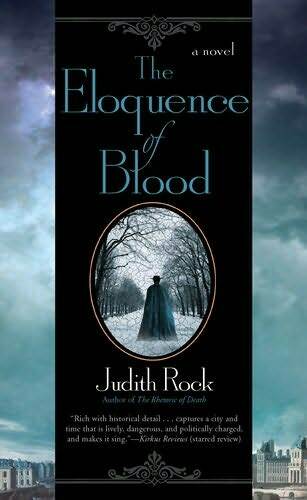 Historical fiction can take you back in time to other eras, and historical mysteries can take you back in time while you stay up late trying to find out “who did it.” “Staying up late” is exactly what happened to me when I read The Eloquence of Blood by Judith Rock. This historical mystery combines interesting characters (both real-life and imagined), an intriguing murder-mystery, and wonderful historical details into a book that was hard for me to put down. It is set in Paris in 1686—the Paris of the people, not the Paris of the glittering court of Louis XIV. The hero and detective is Charles du Lac, a former soldier, who is studying for the Jesuit priesthood and is a teacher at the Louis le Grand, a Jesuit school for boys. Despite being part of the Jesuit holdings, the school could use an infusion of funds and there is a rumor that a bequest to the school from the Mynette family will become available. While on a visit to a local family, Charles du Lac meets Martine, a young woman who also has a claim on the same inheritance, though the papers proving her claim as an adopted daughter have gone missing. The next day Martine is found murdered. Her murder incites anti-Jesuit sentiments and protests against the school. Father Le Picart, head of the school, asks Charles to help the police discover the murderer. While the motivation of Le Picart is to preserve the school’s and the Jesuits’ reputations, Charles’ motivation is to find justice for a murdered young woman. During Charles’ journey to find the killer, he encounters quite of range of Parisian society, from respectable and not-so-respectable businessmen to street people begging on every corner. One of the real-life characters in the book is Nicolas de La Reynie, the first head of the Paris police, with whom Charles develops a friendship. As a student of dance history, I especially enjoyed reading about the Jesuits and their role in the development of Baroque dance (the beginnings of modern ballet). The Jesuits believed in developing both the minds and the bodies of their students and dance was considered essential training for future gentlemen. Their students regularly participated in productions featuring music, choral works, drama, and dance. The Eloquence of Blood is Rock’s second book featuring Charles du Lac. His first adventure is The Rhetoric of Death. I haven’t read the first book yet, but that did not diminish my enjoyment or cause any confusion by reading The Eloquence of Blood first. I’m looking forward to reading the first book as well as Charles’ future adventures! The theft of rare Greek artifacts from the British Museum is the main mystery in And Only to Deceive, but it’s not the only mystery. Who’s making and buying forged artifacts as well as a possible murder heighten the suspense. Using the 19th-century obsession with classical antiquities as a backdrop, author Tasha Alexander deftly blends interesting characters, historical facts and literature, and intriguing settings. 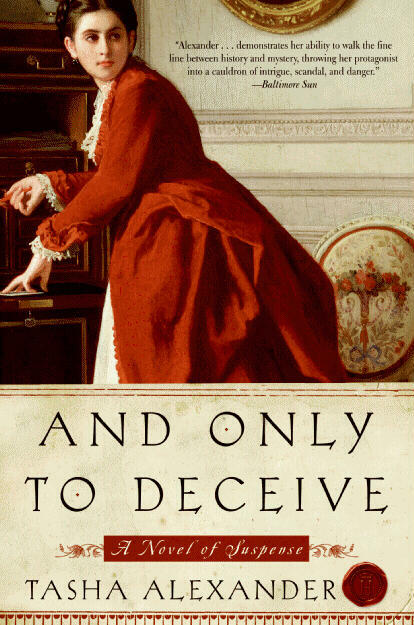 And Only to Deceive is her first novel in the series that features Emily, Lady Ashton. Set in the late 1880s, the book begins as Emily nears the end of her two-year mourning period for her late husband. Married only a few months before her husband’s death on an African safari, Emily hardly knew her husband and had married him only to escape her mother’s constant demands to marry. When one of her husband’s friends, Colin Hargreaves, visits Emily, he tells her of his promise to her husband to take Emily to visit Lord Ashton’s and now Emily’s villa in Greece. The prospect of this trip leads Emily to her husband’s bookshelves and she discovers his love of Greece and ancient antiquities. As Emily starts to learn about ancient Greece, its language and art, she not only finds her own capacity for learning but also starts to love her dead husband. Emily’s discovery at her country home of artifacts that should have been in the British Museum starts her on a journey to determine if her late husband had been dealing in black market forgeries. As she works to prove her husband’s innocence, she finds herself being courted by two men, neither of whom she is certain she can trust. Emily, though, finds she enjoys the unique position of widowhood and is not anxious to trade her freedom for a husband any time soon. While I enjoyed the mystery of the art thefts and forgeries, I think I enjoyed the story of Emily’s journey of self-discovery just as much. Society in upper class Victorian England had many rules and Tasha Alexander highlights the various pressures on women to conform to society’s expectations in her novels. Women’s lives were totally defined by their husbands—finding a husband, marriage, having children, and following the rules of mourning when their husbands died. As Emily ends the prescribed mourning period, she finds herself wanting to be a little bit rebellious; she wants to start pushing back at society’s expectations. As the story progresses, Emily begins to grow as a person and starts to make plans for her future. If you want to follow the further adventures of Emily, Lady Ashton, you can find them in A Poisoned Season, A Fatal Waltz, Tears of Pearl, Dangerous to Know and to be released this month, A Crimson Warning.